Location: South side of the B4393 road. Notes: Four Crosses was situated on the Cambrian Railway (CR) main line that linked Whitchurch and Aberystwyth. The section of line on which Four Crosses stood was authorised as part of the Oswestry & Newtown Railway (O&NR) on 26 June 1855 and work began on it on 4 August 1857. By 1860 the section of line between Oswestry and Pool Quay was almost complete. It was inspected on 18 April 1860 by Colonel Yolland who recommended some modifications. The modifications were carried out and the line opened between Oswestry and Pool Quay on 1 May 1860. The station was located on the eastern edge of its village namesake to the south of the Four Crosses – Llandrinio road which passed over the line on a bridge. The line was single track and one platform was provided on the west side of the line. The station was provided with a handsome brick-built villa of two storeys. A gable was presented to the platform, with a canted bay on the ground floor. On the ridge-roofed southern section a smaller attic gable was provided, and these and other gables carried heavy, pierced bargeboards and finials. 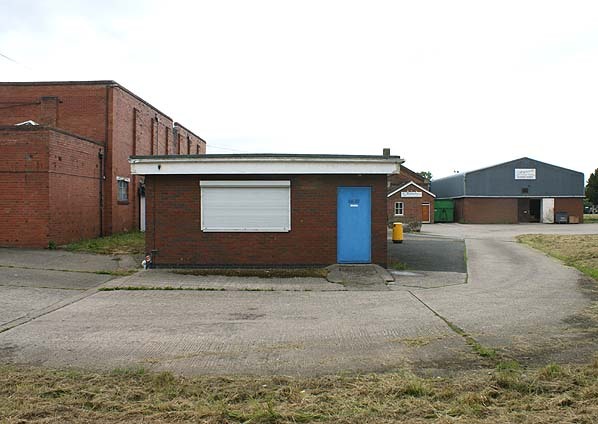 The northern section of the building was a single-storey office range with a tall pitched roof. Four Crosses had goods facilities which were located to the south of the passenger station also on the west side of the line. They consisted of sidings and a large brick-built, single-road goods shed with blind, horizontal-topped arcading facing the running lines. At the time of opening there were four passenger trains in each direction between Oswestry and Pool Quay. The line was extended to Welshpool on 14 August 1860 and onward to Newtown on 10 June 1861. On 25 July 1864 the O&NR merged with the Llanidloes & Newtown Railway, the Oswestry, Ellesmere & Whitchurch Railway and the Newtown & Machynlleth Railway to form the CR (which also absorbed the Aberystwyth & Welch [sic] Coast Railway in 1865). The merger of the companies created the through route between Aberystwyth and Whitchurch. The December 1895 timetable showed 7 up and 6 down trains Monday-to-Saturday as seen in the table below. There was an extra up train on Wednesdays and one in each direction on Sundays. During the 1890s improvements were made along the CR main line which resulted in better timekeeping and faster services. Four Crosses station benefited from the improvements as a passing loop and a new platform were provided. Because of space constraints the new platform was located to the south of the original opposite the goods shed. The new platform served the down line (Newtown direction) that had been created by the installation of the passing loop. The original platform served the up line (Oswestry direction). A barrow crossing linked the south end of the up platform to the north end of the down. A single-storey waiting room constructed of timber was provided on the down platform. The loop and new platform opened on 2 July 1899. To the north of the down platform (on the north side of the barrow crossing) a signal box was opened to control the passing loop and access to the goods sidings. On 1 January 1922 the CR was absorbed into the Great Western Railway (GWR). The July 1922 timetable showed 3 up and 6 down trains Monday-to-Friday. On the first and third On Wednesdays there was an extra up train with a further up service on the first and third Monday of the month. On Saturdays there was an extra down train. No trains called at Four Crosses on Sundays. The GWR made further improvements to the CR main line which speeded up journey times. Four Crosses became part of British Railways [Western Region] (BR[WR]) at nationalisation on 1 January 1948. By the September 1955 there were 7 up and 6 down trains on the main line on Monday-to-Saturday. On Sunday there was one train in each direction. The level of service remained the same for the rest of the 1950s and into the 1960s. On 1 January 1963 Four Crosses passed to the operational control of British Railways [London Midland Region] (BR[LMR]). Three months later the Reshaping of British Railways (the ‘Beeching Report’) was published. It recommended that the line from Buttington Junction to Whitchurch, and the branch to Llanfyllin should lose their passenger service, and the intention was that the line should close completely between Buttington and Llynclys (including the Llanfyllin branch). The intention to withdraw passenger services was published on 11 March 1964, and the TUCC report on the closure hearings was received by Ernest Marples, Minister of Transport, on 13 July 1964. His consent to the closure was announced on 11 September 1964. The 7 September 1964 timetable showed 8 up and 6 down trains Monday-to-Friday as seen in the table below. On Saturday there was one less up train; on Sunday one train ran in each direction. On 2 November 1964 Four Crosses closed to goods. 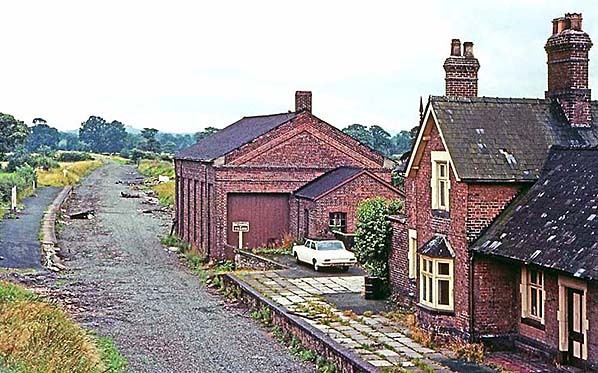 The last trains ran to and from Four Crosses on Saturday 16 January 1965 and on Monday 18 January the line through the station, between Buttington and Llynclys Junction closed completely; track-lifting followed later in the year. 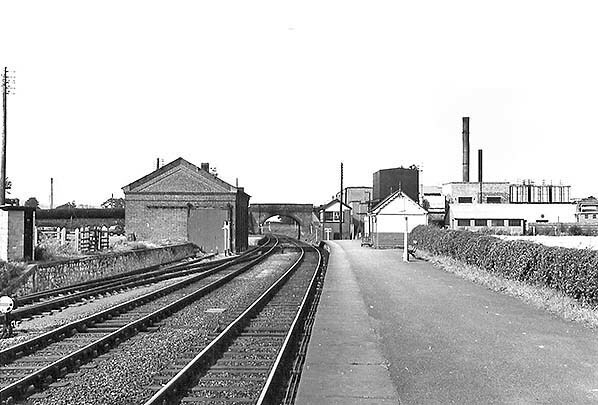 A few years after closure the up platform and station building were demolished by 1978 and the site was developed as an industrial area. 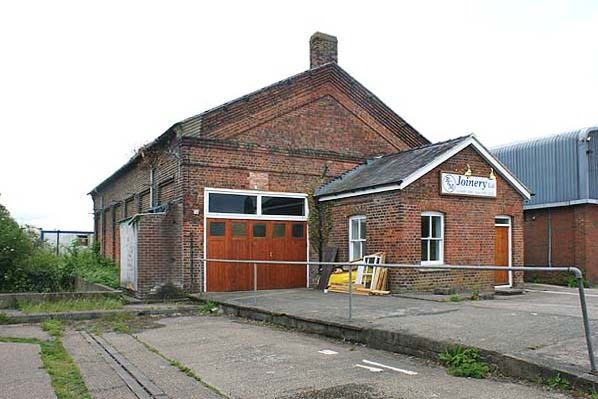 The goods shed was retained and incorporated into the development. The down platform, without its waiting room, survived into the 1970s. The goods shed is still standing in 2016. A Regional History of the Railways of Great Britain - Volume II North & Mid Wales - Peter E Baughan - David & Charles 1980. Encyclopaedia of British Railway Companies - Christopher Awdry - Guild Publishing 1990. Railway Passenger Stations in Great Britain - A Chronology - Michael Quick - Railway & Canal Historical Society 2009. Four Crosses station looking north in the first decade of the 20th century. 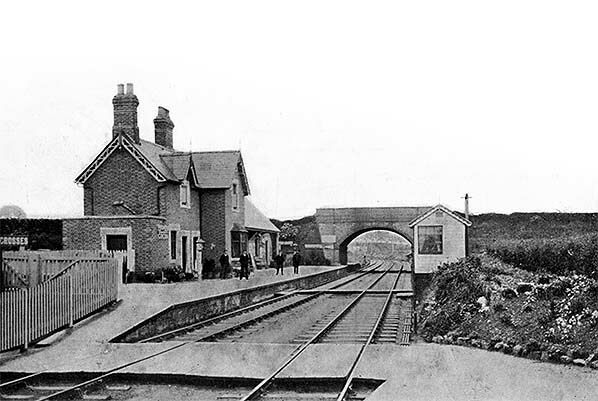 The view was taken from the down platform which had come into use on 2 July 1899 when a passing loop had opened at the station. To the left can be seen the original building and platform which became the up side of the station when the loop opened. platform and no passing loop. Four Crosses station shown on a six-inch scale map from 1902. The map shows the down platform that had come into use on 2 July 1899. 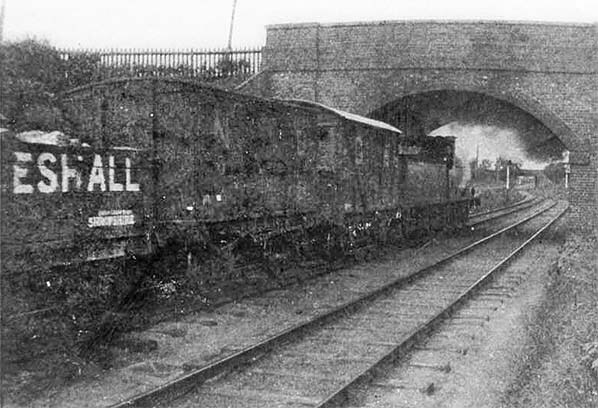 A northbound freight train is seen passing through Four Crosses in 1920. 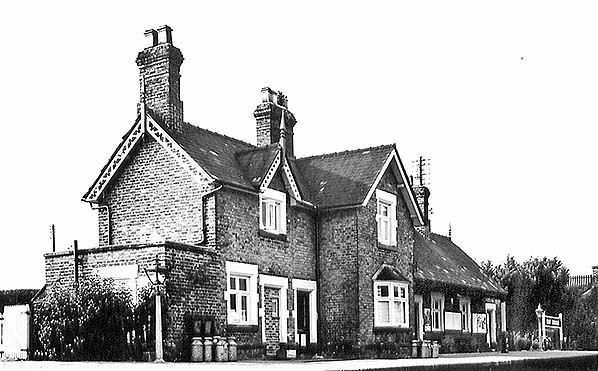 The station building at Four Crosses seen in 1955. A view looking north along the Four Crosses station down platform in the 1950s. The cattle loading dock and goods shed can be seen to the left. 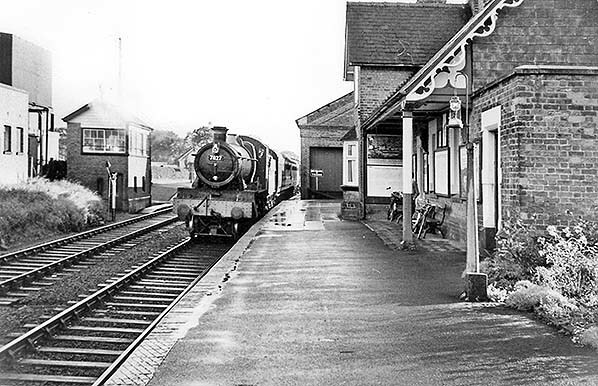 Four Crosses station looking south along the up platform in 1963 as a train for Whitchurch draws in. A view looking south at Four Crosses station in August 1966 shortly after the track had been lifted. The site of Four Crosses station looking south on 28 June 2013. The Four Crosses goods shed looking south from the trackbed of the former Cambrian Railway main line on 28 June 2013.